There’s a very disturbing article in the New York Times today. Well, it’s more of a murder confession than an article. 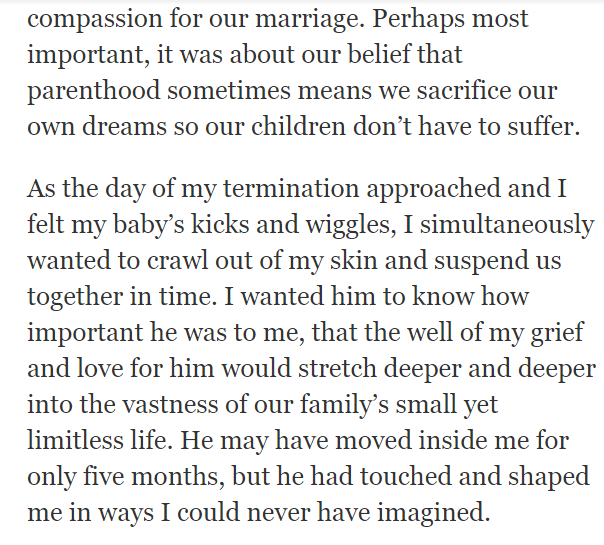 A woman explains why she and her husband had their son aborted after 5 months of pregnancy. 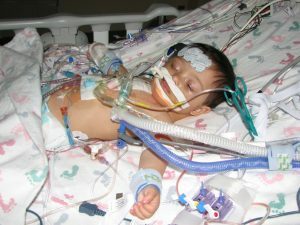 Apparently they found out that he had an abnormal heart and would likely require a heart transplant. Instead of going through all of that trouble, they decided to have the child killed. She says they found out about the diagnoses at 21 weeks. At 22 weeks, they came to a consensus on abortion. It took them just a week. In contrast, it took my wife and I about 3 months to settle on a name for our unborn son. There’s something especially horrific about the fact that they decided to condemn their son to death in about a 1/12 of the time it took us to give our son a name. Anyway, the entire article is terrifying and heinous, but the passage below is perhaps the most stomach churning. Notice how she positions her son’s execution as a sacrifice they are making for his sake. They are giving him the gift of a painful death, and they expect to be applauded for it. In the next paragraph, she says she “loves” her son and that he was “important to them.” Although not important enough for them to bother dealing with his health problems. Make no mistake, this true wickedness and depravity. Their excuses for aborting their son are not compelling or legitimate in the slightest. But at least, when we read this, it gives us a glimpse into the rationalizations parents make when deciding to kill their children for the sake of convenience. And we see that those rationalizations are truly incoherent, even insane. I am compelled to share our story. I was 14 weeks pregnant when an ultrasound revealed our son had a heart defect. 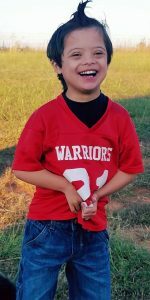 The doctor suggested we test for Down Syndrome because he had an AV Canal defect and two in three children born with this particular defect have DS. An amino revealed our baby boy had an extra 21st chromosome. The first question I was asked when given the results was if I wanted to terminate my pregnancy. She told me that I only had a short time to make a decision or I would have to leave the state for termination. I told the nurse…..No thank you. Not an option. I am a very Christian woman and abortion is not an option. This is our baby… please never mention that again. 7 years and two heart surgeries later…..this is our beautiful son Jake. He is amazing. He is a fighter….and has taught our family more about love and life than we could have ever imagined. He is a Gift. Parents who “decide” to take the life of their unborn child are not showing mercy. It is selfish and they are giving up the very best part of their lives.